The Jesus statue over Cusco. We made some llama friends today! They’re just as soft as they look. The Andean Condor! The bird with the largest wingspan in the world! Quechua girl in traditional wear. Yesterday we hit the streets of Cusco once more, including a visit to a delish chocolate museum (complete with cocoa tea and fondue), to a surprisingly sophisticated flea market, and of all places, to an authentic Italian restaurant. Be sure to check out the photos in posts below. Today, however, was the start of training. It was an orientation to the Alma Sana project, detailing our roles as interns and the relationship we would have with other study staff. Here’s a recap of the research I will be assisting: Alma Sana Inc. is a social enterprise that designed vaccination-reminder bracelets aiming to increase the timeliness and completion of immunizations among children. A child between 0 to 3 months (at the consent of the mother or primary caregiver) will wear a bracelet of the LIVESTRONG style, which has shapes and numbers corresponding to vaccinations he/she needs during the first years of life. The expectation is the bracelet will be a visible reminder for mothers to bring their child in for his/her scheduled immunizations. This summer in Cusco, Peru and Ecuador Alma Sana Inc. is conducting a pilot study funded by the Gates Foundation to determine the feasibility of these bracelets. 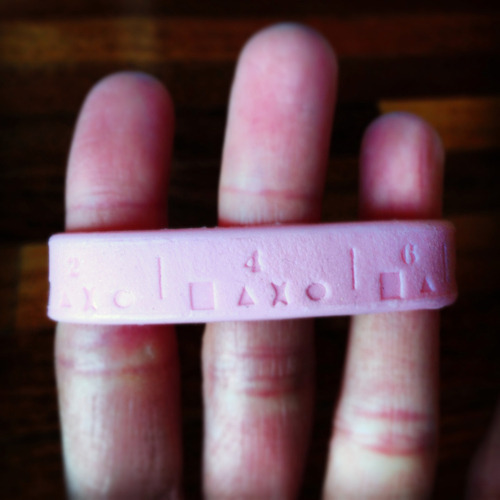 The idea of a reminder bracelet appears amazingly simple, but is it really? Will the mothers actually reference them? Will they then return to the clinics for their babies’ shots? Will the nurses at clinics administering vaccinations find the bracelet tracking to be a burden or time-reducer? Our hope is that this pilot study will answer these questions and in turn show if these bracelets could serve as a basic immunization record system, and have the potential to save many children’s lives from infectious diseases common in developing countries. For more information about the background and purpose of Alma Sana’s mission: CHECK OUT THIS VIDEO. This was the first day of training, so it was only an overview of the project’s timeline and goals, as well as of the interns’ anticipated responsibilities. There are six interns, and we will be working under one program coordinator. Our study plans to enroll mothers at two clinics in Cusco, with three interns working at each. As an intern I will be at one of the clinics, explaining to mothers with infants about the study (in Spanish of course!) and asking whether or not they would like to participate. If they do, we will next place a bracelet on their baby’s ankle (not the wrist so they don’t chew on it, etc.) and hole-punch the symbols on it that correspond to the vaccines they have received and are receiving that day. Once they are enrolled, they will have to return to the same clinic for future vaccines and we will hole-punch the bracelet and track the timing. It’s both super exciting and nerve-racking to think in a week I will be in a clinic, having conversations with mothers, and helping with a project that may just strike public health gold. Next week we will be taking intensive Spanish classes to refresh our knowledge of the language, and also doing role-play exercises to perfect the practice of kindly and respectfully recruiting mothers into the study. Another neat aspect is that when not enrolling mothers, we will be able to assist in the clinic where needed—whether that means playing with children waiting in line or doing tasks with the nurses. On days we are not working, we are free to explore Cusco or go on trips to awesome locations like Machu Picchu and Sacred Valley. Receiving all this information today reminded me of why this internship is such a wonderful, unique opportunity. This project, or more so these bracelets, has such an innovative and collaborative design. As interns we will be working closely with the clinic nurses, and therefore local health workers will be deeply involved. This is important for the project’s sustainability, and its achievement of increasing vaccination rates for a health system experiencing challenges in that area. Alma Sana ultimately wishes to empower the mothers. Like I mentioned before, watch the the video to see why these bracelets may make a difference in low-income, under-educated communities where paper-based vaccine record systems pose difficulties and/or inefficiency. Although all we did today was sit and listen to the study’s plans, I gradually and powerfully realized that I was soon going to be part of the action. I thank God for this fantastic chance to join in a global health effort, to serve others, and discover how I can best serve Him with my career. Tomorrow we will visit the clinics and meet their medical staff for the first time. It is sure to be eye-opening! Cusco at night! See la cruz up on the hill? Today we came upon a parade of cute children in costumes in Plaza de Armas. What could be better? It was La Dia de Educación in Cusco, the celebration of when education started (or we’re pretty sure that’s what the woman who explained it to us said). Walking around a chocolate museum. Man smiles for the camera. Today we explored the captivating city of Cusco for the first time! Yesterday was a recovery day from the 8-hour layover in Lima and the dramatic drop in oxygen after rising to Cusco’s 11,000+ ft. We have maté (a tea drink) to smooth our bodies’ transition to the altitude. The clouds and sun are closer than ever in my life. Lovely hills wrap around the city, creating an optical illusion that causes us to forget that we are actually nestled among lofty mountains. After settling into our modest, but delightfully purple apartment in the neighborhood of Quispicanchi, our group hit the local supermercados to buy food for future dinners. 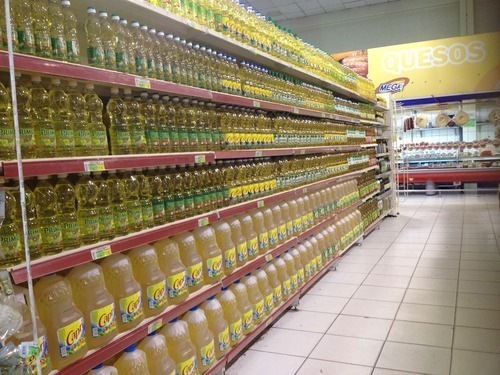 I was surprised by the stores’ aisles of… cooking oil. Haha. Today, we caught cabs to the Plaza De Armas, one of Cusco’s most iconic locations. It was stunning, to say the least. I can let the pictures speak for themselves, but I will say that I am excited in future weeks to explore the area further. During our time in the Plaza a mini-protest was happening, not too wild, but interesting to witness. Adults and children marched with signs and white flags saying phrases like, “Abajo corrupción.” My supervisior said such protests are an everyday thing—or at least a festival or some activity always seems to be ensuing in the Plaza. I’ll have to document what’s going on every time I go there. The rest of the day was filled with introductions to the touristy parts of Cusco. We visited multiple plazas, stopped by a market to drink freshly squeezed juice (I had an orange and strawberry mix) and stare in horror at the array of animal organs for sale, bought temporary cellphones, wandered on cobblestone streets, and admired the local kids’ fancy school uniforms complete with hats. I was personally in awe of the many cathedrals, the vibrant colors of buildings, and the brilliant blue sky overhead. We also saw many Quechua people, the indigenous group of the Inca, in person for the first time. Dwelling on the outskirts of Cusco, they are easily spotted due to their bright traditional clothing and short stature. We may interact with Quechua mothers once we start working in the clinics for the Alma Sana study. So far, my favorite part of Cusco is its surrounding landscape and complementary architecture. Houses are stacked upon the hills and edifices line little roads… this is the first time I have seen anything like it, although I know similar settings exist around the world. It is as cool as I imagined, and in stark contrast to Visalia, CA, Ithaca, NY, or NYC. Overall, my first impression of Cusco was extremely pleasant and inviting. I can’t wait to improve my Spanish and dive into the Peruvian culture.